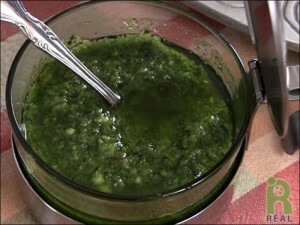 Swirl this puree of garlic, basil and oil into any vegetable soup for extra flavor. 1. Finely chop basil and garlic and place in a small bowl or jar. 2. Add 1/2 cup olive oil to the garlic and basil and blend ingredients together well. Pistou may be refrigerated. Watch the video below for making the the pistou.